We are big fans of Mazda's MX-5. Mike is an experienced racer and successfully competes with his own Mk1, so knows their quirks and foibles better than anyone. 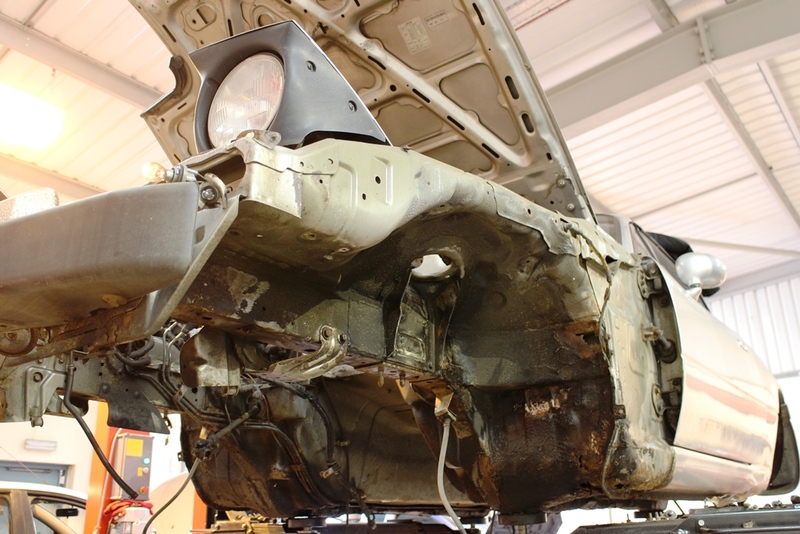 On this page we share a case study of a major restoration of a very early Mk1 MX-5, a car we're sure is a future classic. 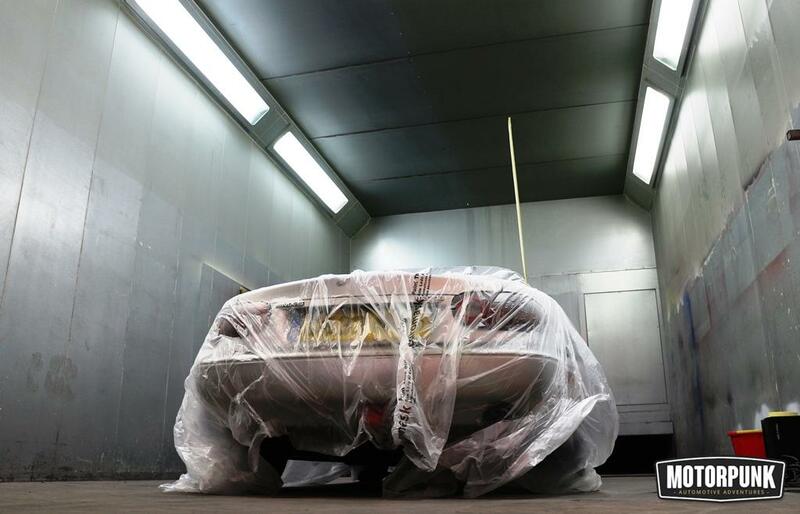 We'd love to hear from you if you've a similar car in need of some TLC. You can contact us here. Part 1 - This car (above) belongs to motoring writer Rich Duisberg, and, as he freely admits - it has had a hard life. The chassis number is in the ...500's meaning it is one of the oldest Mk1 on the road. His intention (and our aim) is to restore it to the original spec and get it looking like it did when it left the factory in Japan over 25 years ago. At ten paces this car looks OK but the fact it arrived on a trailer tells a different story. Up on the ramps we see original and heavily crusted suspension, worn out bushes and, as fellow MX-5 owners will know to expect, quite a bit of rust. It also needs work on the brakes, exhaust, roof and trim. 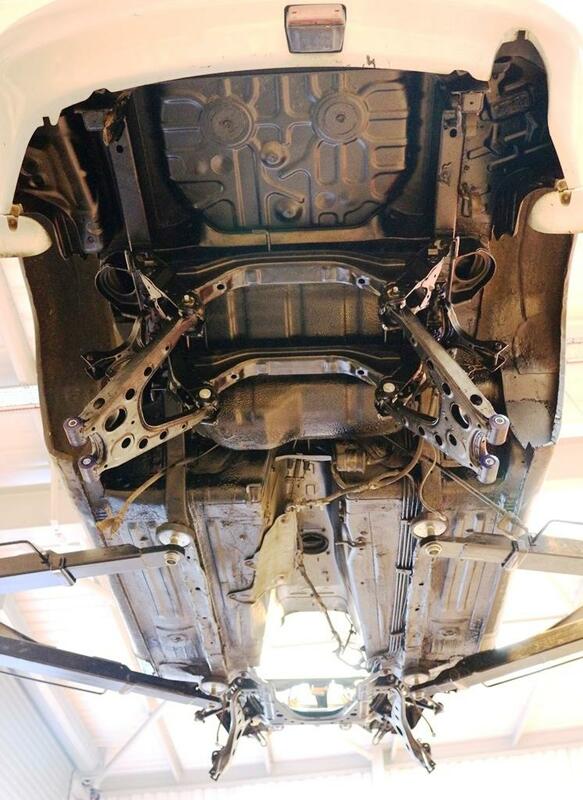 We aim to repair or replace both front wings (rust), perhaps the doors too (rust) and clean up the patchwork underside which has suffered from, yes, rust. It's well worth saving though, we'll also service it and get it in good shape in the coming weeks. This car is due to be featured alongside the forthcoming Mk4 MX-5 later this year. Check back for part 2 of our restoration in late June where we look at how to fix some of that crust in more detail! In the meantime, here's a little film showing this car in action in a film of the history of the MX-5. Part 2 - We once heard that the Japanese word for Ferrous Oxide is Eunos. You don't have to be an MX-5 geek to appreciate that these lovely little roadsters all suffer from rust. See pics above. 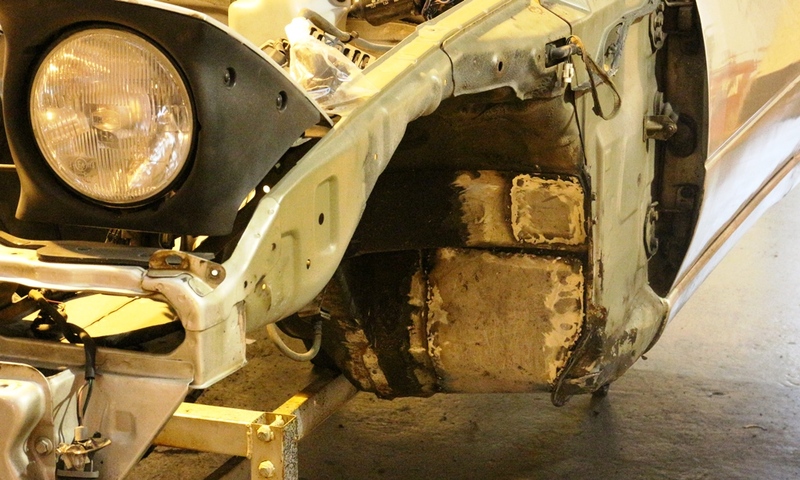 With this car the front wings are beyond repair, a hole appearing above the join with the bumper and the bottoms of the wings where they meet the sill are rotted away from the inside. Removed, the wings are discarded and the inner wings cleaed up ready for welding. New wings are on order and aren't that expensive. 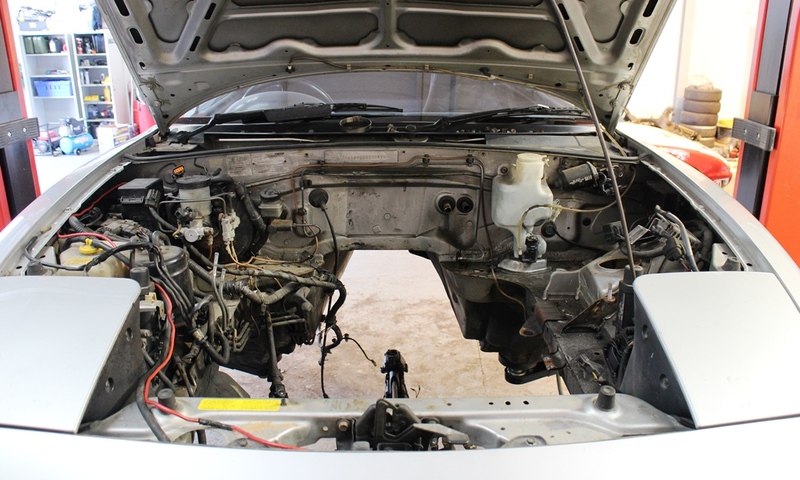 We've removed the front bumper for ease of access, as you can see. 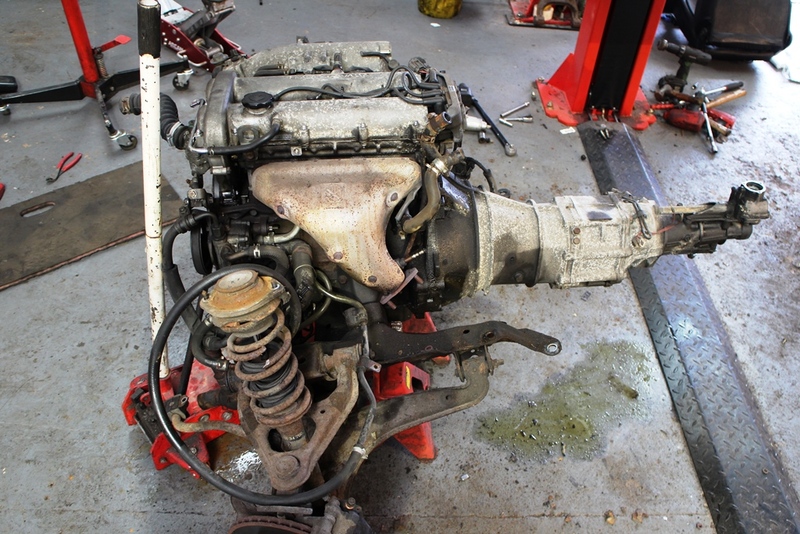 We've also carefully removed the engine, transmission and suspension as they're all fit for an overhaul. Part 3 - Happily, MX-5 engines and transmissions are pretty robust and with regular servicing will rack up 200,000 miles or more, quite comfortably. This example (above) has done about 125k miles already and still runs beautifully. It has been removed as we make space to work on the tired old suspension and weld up it's rusty bits. You can see from the picture above right that one coil spring is broken and that the arms are pretty crusty. The shock absorbers are also all original, as are what's left of the bushes. 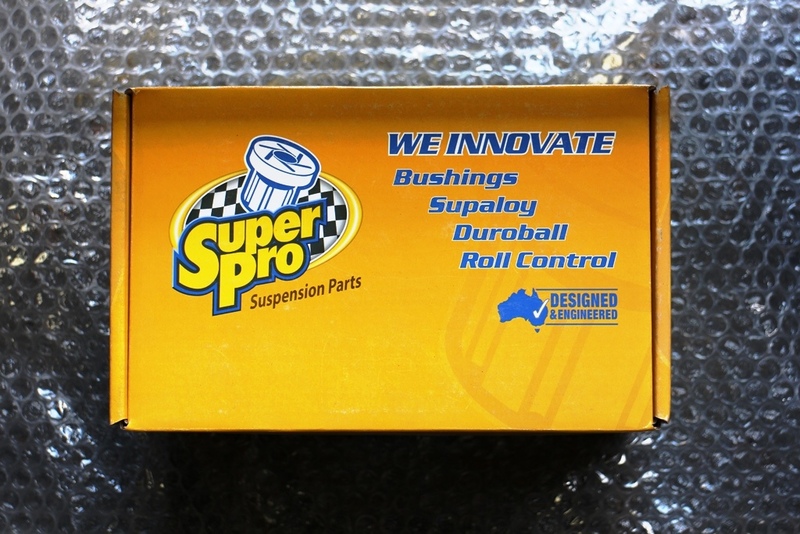 We are stockists for Super-Pro bushes and this car will get a complete refit. More on that in part 4 soon. Part 4 - With the drivetrain out of the way and wings and bumper off, we can start welding. 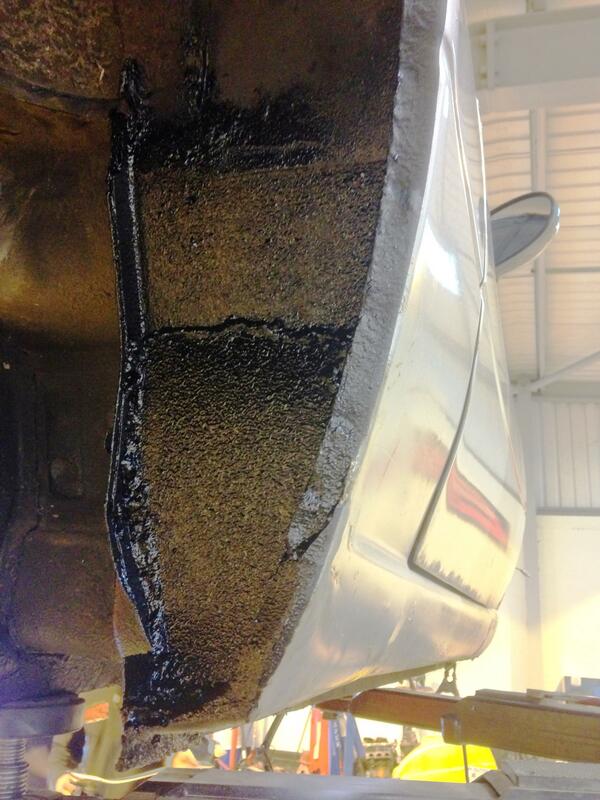 MX-5s will rust on the sills, often from the inside out due to blocked drain holes, but they aren't the only grot-spot. 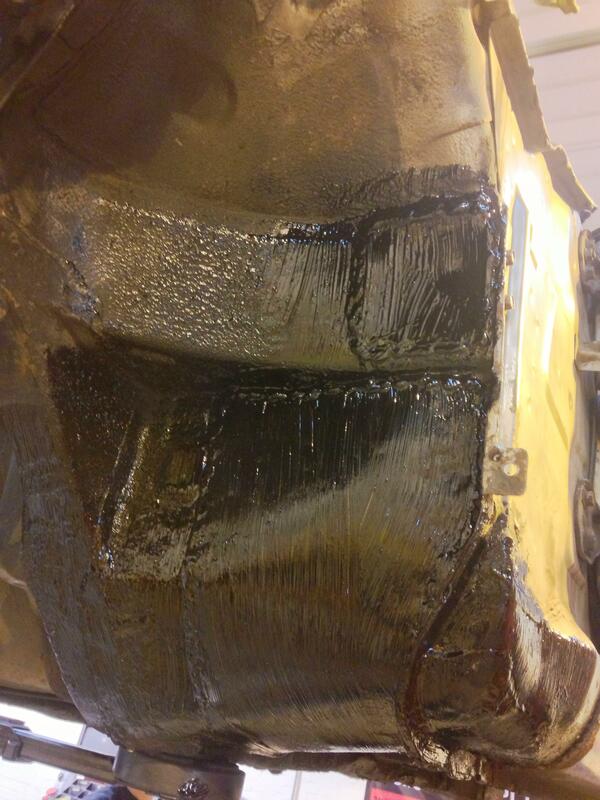 Inside the front wheel arches take a pasting and scraping off muck and underseal we can see a repair is needed. Here we clean up the area and weld in plates formed to shape. See pic (left) for some work in progress. 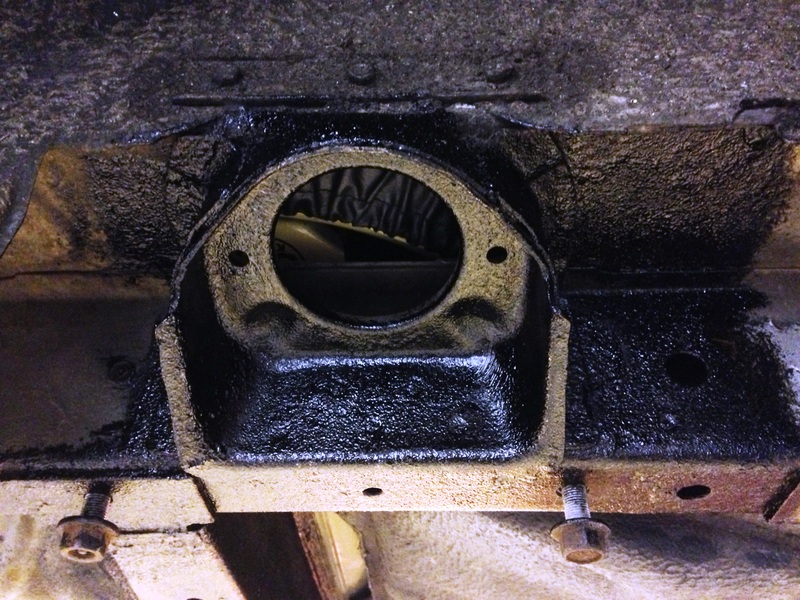 We've also repaired the rear wheel arches, taking care not to block drain holes, we don't want to repair it again for at least a few years! Part 5 - These are pretty rims, aren't they? 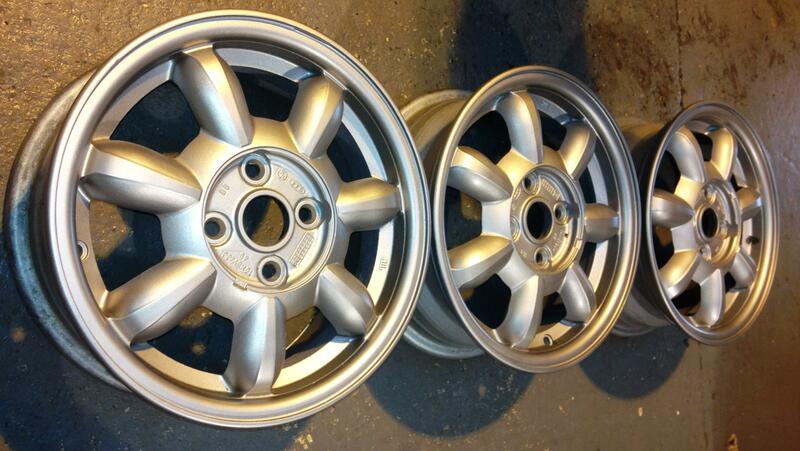 To refurbish them we removed the Toyo tyres, blasted them and had them repainted. The owner is to be complimented on the lack of kerbing (although we could have fixed that too, if needed). 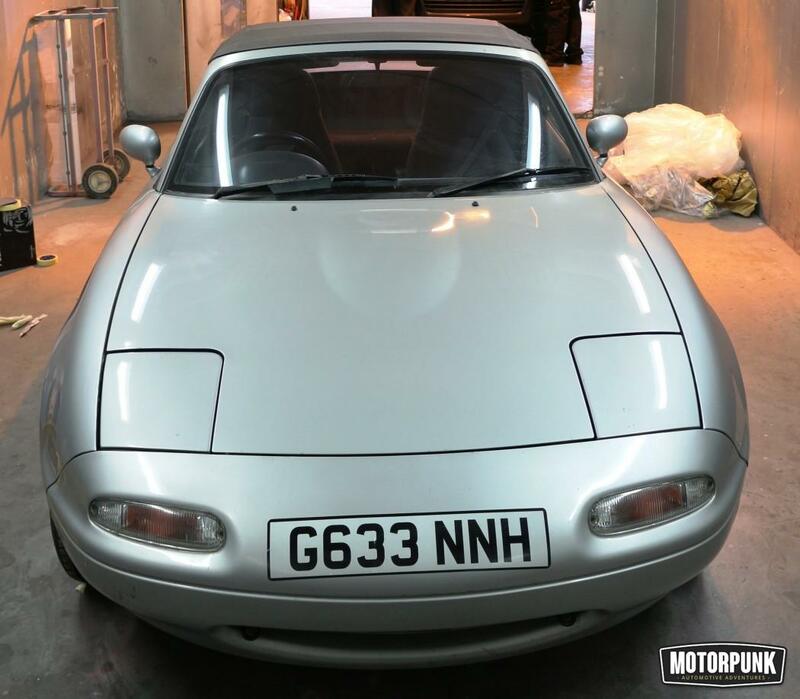 When restoring an MX-5 we do numerous jobs in parallel, no waiting for bits before we start something else, meaning our service gets you back on the road quickly. 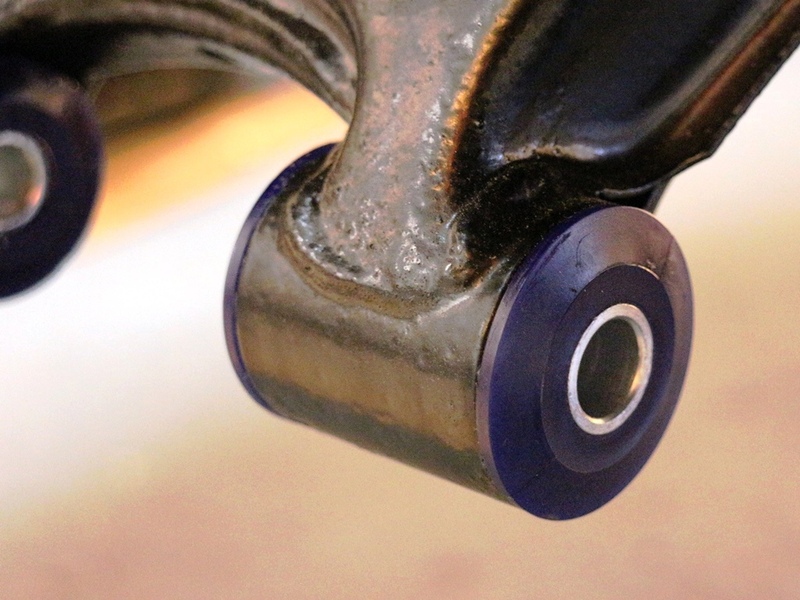 Refurbishing these wheels was a nice little job and we're happy with the result. See picture, right. Part 6 - Underseal. With the welding complete we clean up and start to apply liberal amounts of underseal to protect our work. See pictures below and left. 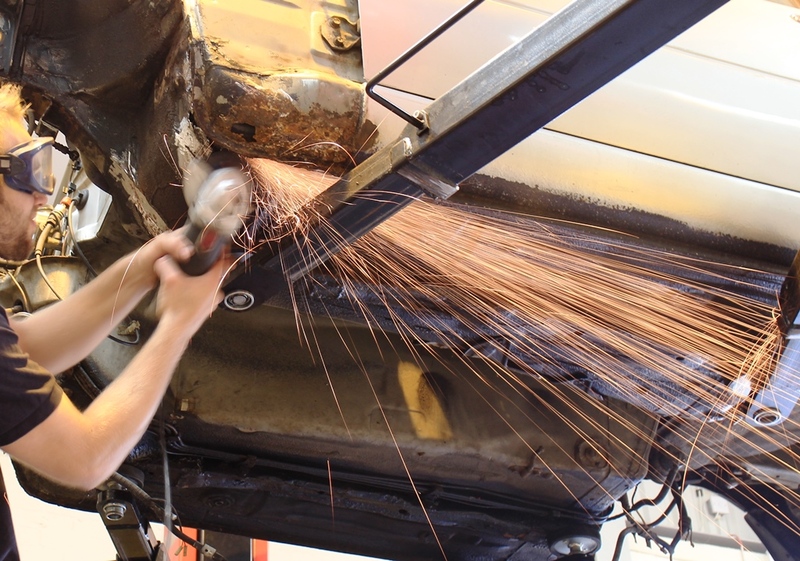 MX-5 metal is notoriously thin and susceptible to rust, we want to make sure our repairs are good for a decade. These cars are worth saving! 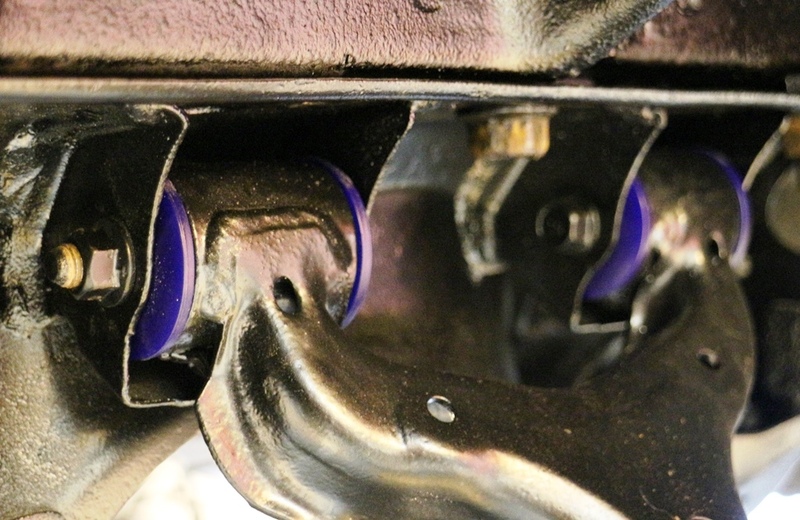 Part 8 - Coil-overs on! See right. 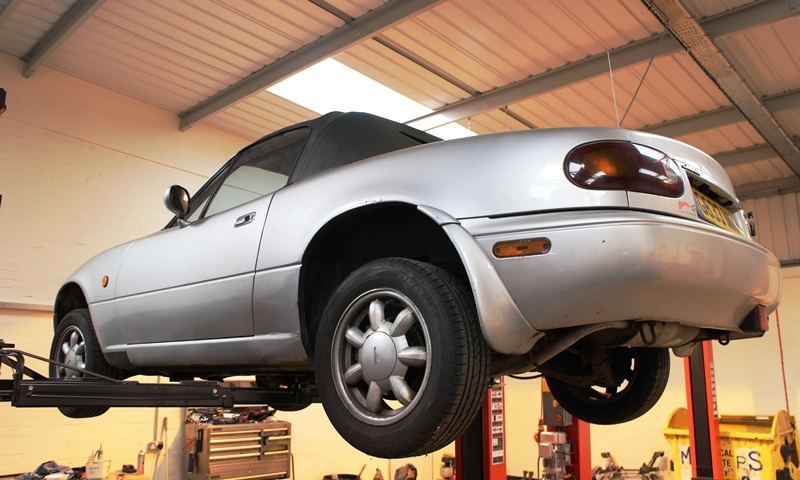 The standard suspension set-up on MX-5s is pretty compliant, but we couldn't put the old shocks and springs back on this car, so it gets a set of replacement coil-overs and a 10mm suspension drop. We set up the geometry too, with new bushes and arms everything is now straight and true. The car will now handle as it should. 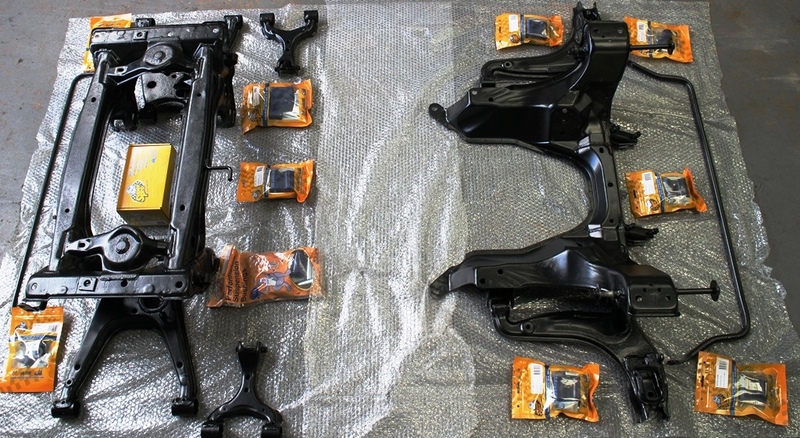 Note also the refurbished calipers, and the treated and undersealed metalwork. We apologise for the bottle of brake fluid that just wandered into shot! Next job: paint those lovely new wings! Part 9 - Paintshop time. See left. Our neighbours here in East Goscote are a professional paintshop with not only a huge booth and all the right kit but many years of experience. Our car isn't having a full respray but we do the bottom of the doors and the new wings. Silver is often tricky to match but we're happy with the result. Oh, and we've fitted a new mohair roof with glass rear screen! Part 10 - A car fit for filming. With the car MOT'd (passed first time with no advisories), it's handed over to Rich Duisberg who takes it down to Llandow to film a little documentary for CBS's XCAR channel, benchmarked against the new MK4 MX-5. And the result? Everyone, camera crew included, queued up to try the MK1! Picture below and we'll link the film when it goes live. Thanks for reading. 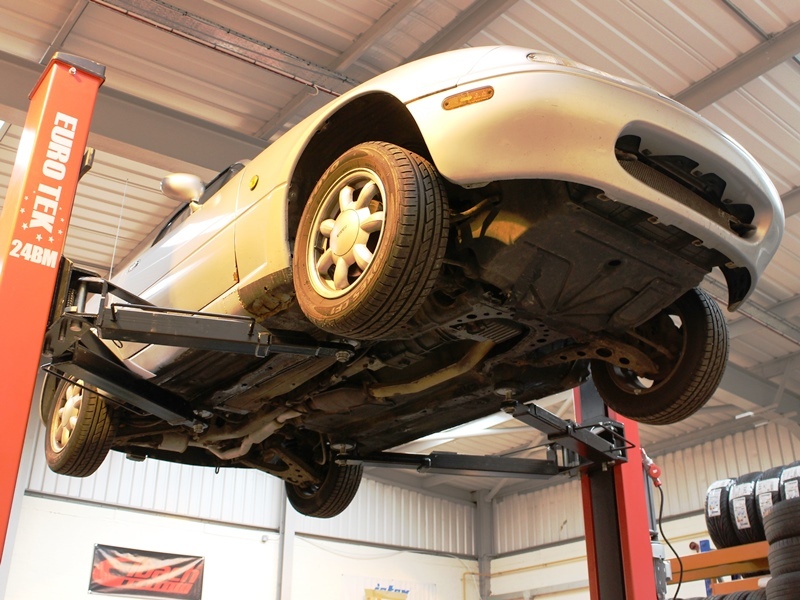 If you have an MX-5 needing work, we'd be happy to help you too. All pictures copyright Thrussington garage, taken by Rich Duisberg of MotorPunk.